Due to the Scotch Whisky Regulations 2009, whisky may no longer be called a “vatted” malt and instead it must be called a “blended malt”. 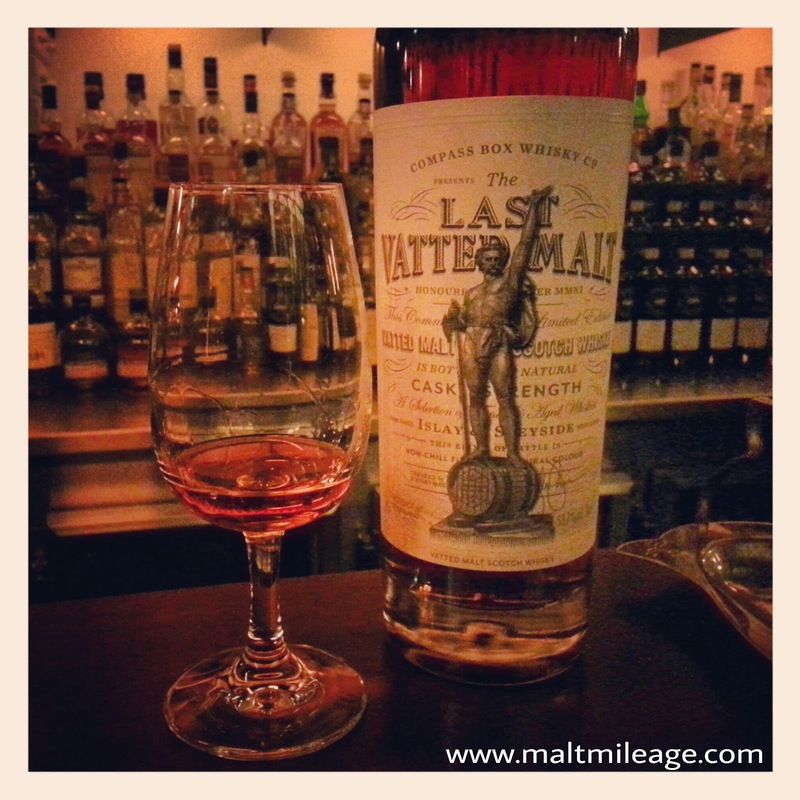 This whisky bids farewell to the “vatted malt”, and it is aptly named the “Last Vatted Malt”. A “vatted” malt is a blend of malt whiskies from different distilleries. The Last Vatted Malt is a marriage of a 36 year old Speyside from the town of Aberlour and a 26 year old Islay from the town of Port Askaig; a marriage which resonates with harmonious unity that never clashes. The Speyside whisky was matured in ex-sherry butts and makes up 22% of the blend, while the Islay whisky was matured in American oak hogsheads and it makes up the rest of the blend. This whisky therefore fuses the realms of Islay and Speyside, and in my opinion it offers the very best from each region! The smoke and peat interacts with rich fruit notes, which in my view resemble a dense raspberry cheesecake layered with ripe caramelized mixed berries and dried fruit. The sweet fruit and sherry carries the tingle of peat smoke and a crackle of polished wood, as the dried fruit becomes more dominant towards the end. There is a fragrant scent of died tobacco that flickers gently on the palate in the rich dense sherry inspired fruit and buzzing with an electric charm is the peat that gently electrifies the taste buds to life as notes of burnt toffee linger. This whisky is deliciously complex, smooth like velvet and yet has a ferocious and crisp snap! The interaction between the peat and the sherry was sublime. Just as the flavours were destined to clash, they just “worked” and melded together in a harmonious way. This is an example of an almost perfect marriage!